Bramblewood Cottage is conveniently situated only 3 minutes walk from the town centre with stunning views over Fitz Park, the River Greta and the fells. All rooms are en-suite, comfortable and tastefully furnished to a high standard, with cotton sheets and Egyptian cotten towels, colour flat screen digital televisions, well stocked beverage tray (Fairtrade), radio alarms, hair dryers and M&S toiletries. Ground floor rooms are available. 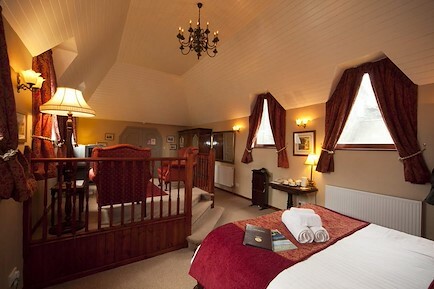 We also have a superior room on the first floor for that extra special treat. For breakfast we have a wide selection for all tastes, including cereals, juices, fresh fruit salad, yoghurts and pastries. You can then follow with a delicious traditional Cumbrian or vegetarian breakfast - made with locally sourced meats and free range eggs, plenty of toast and handmade preserves washed down with Fairtrade tea or coffee. If you prefer a lighter option why not opt for our scrambled egg and smoked salmon on toast, Woodalls Black Coombe Smoked Ham with poached or scrambled eggs on toast or try something different and opt for our melted mature cheddar and black coombe ham filled croissant. Special diets also catered for. Gluten free sausages and bread available on request. We also have a guest lounge with a 32" digital flat screen television, books, games and magazines. We have lots of maps for anyway wishing to go walking whatever your skill level and Steve is always on hand to help with ideas and routes. Packed lunches are available. Limited parking available (we have 3 private spaces) which are on a first come basis or one can be reserved for a small fee. Free Wi-Fi. Non smoking. A warm welcome awaits you. Home from home. DISCOUNT OFFERS : As an Ambassador of the theatre we can offer a £3.00 discount per ticket on many shows, discounts on boat trips and other local attractions. We are located opposite Fitz Park, 3 minutes walk from the town centre and 10 minutes from Lake Derwentwater. We are within walking distance of many of the popular mountains such as Skiddaw and Catbells. Your enquiry will be sent directly to Bramblewood Cottage Guest House. Please fill in as much detail as you can.